"The "wall working" or fence working, described by Parker as a "fine property," is a system of cheap advertising. Where a portion of a wall or fence, near some public thoroughfare, can be rented or obtained gratuitously, it is covered with an array of boards, which are hung up in the morning and taken in at night. 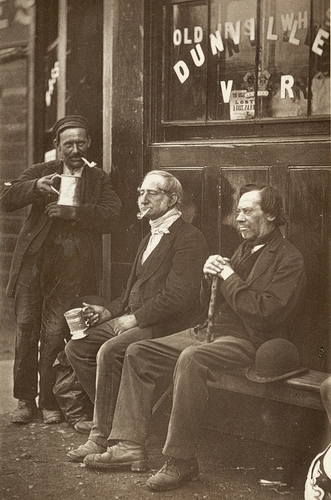 In this instance, the boards covered with thin bills are supplied to Cannon [seated on the right], who hangs them up in the morning and receives about a shilling weekly for each board. But the number of boards afford no clue to the income derived from this mode of advertising, as an indefinite number of dummies are displayed to fill up vacant spaces. The dummies are carefully selected; the advertisements they carry must be as imposing as the names of their owners are respectable. Cannon assured me that it required tact and experience to manage this sort of property. Unfortunately the dummies have been dominant of late, owing to depression in all departments of trade. The result is that the "wall worker's" property produces a return so poor as hardly to repay the pains bestowed on its management."